The University of New Brunswick is proud to announce the Queen Elizabeth II Diamond Jubilee Scholars for 2016-2017. 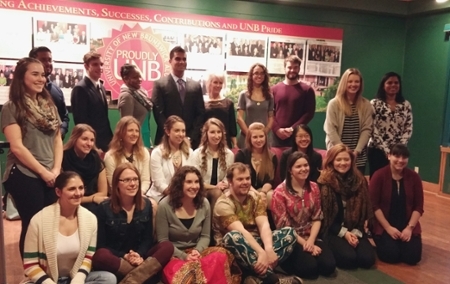 With this funding, UNB students will be able to complete a three-month internship related to their field of study. These internships, offered with the help of partners in Malawi, Zambia, Ghana, Jamaica, and Barbados, will help undergraduate students gain a deeper understanding of development issues. Veronica McGinn, UNB’s coordinator of international development with the office of Global Learning and Engagement, said the scholarship program centers around broadening students’ minds. Emily Jackson, a nursing student who completed an internship in Malawi last year with the help of this scholarship program, said she grew by being pushed outside her comfort zone. The scholarship is open to both graduate and undergraduate students, whom each receive $6,000. There are also incoming international scholars - students who come to UNB from other countries to study. Those students receive $10,000 each. Nursing student Hilary Costello will be heading to Malawi this summer for an internship. She said she has always been interested in working as a nurse internationally.